Ctesiphon was a favorite camping ground of the Parthian kings during the last centuries before Christ. The surviving building probably dates from about the 3rd century A.D. This great Sassanian hall is the widest single-span vault of unreinforced brickwork in the world. The width is over 80 feet and the height from the pavement is 118 feet. The ruins are located on the East bank of the Tigris River a few miles south of Baghdad, Iraq. Here is a photo of my 1970 Bible Land group at Ctesiphon. In the event that any publisher should wish a photo of the structure I have one of the same view without people. 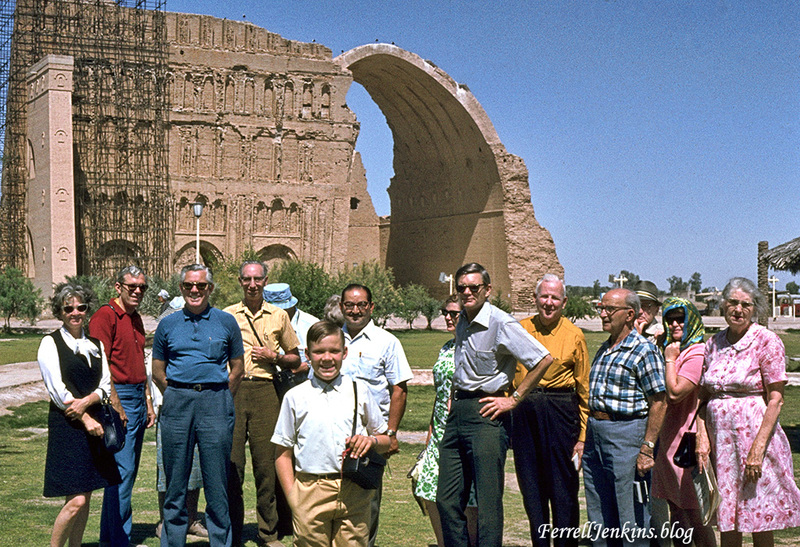 Ferrell Jenkins Bible Land Group at Ctesiphon, near Baghdad, Iraq, May 15, 1970. There were 16 in the group. I made the photo. Three of our group are totally hidden. My son, Ferrell Jr., is in the foreground. The man over his left shoulder was our guide, an Iraqi named George. Several of these tour members are now deceased. This photo was made before I learned how to line up a group for a photo. The Parthians are mentioned only once in the Bible. In the account of the events of the first Pentecost after the resurrection of Jesus we are informed that Parthians were among those present in Jerusalem. The Parthians were the dreaded enemy of Rome in the east. They lived east of the Euphrates. Some prominent scholars on the book of Revelation see a reference to the Parthians in Revelation 9:13-14. Beale says, “In John’s time the Parthian threat from beyond the Euphrates was identified with the OT tradition…” (The Book of Revelation in the NIGTC, p. 507). 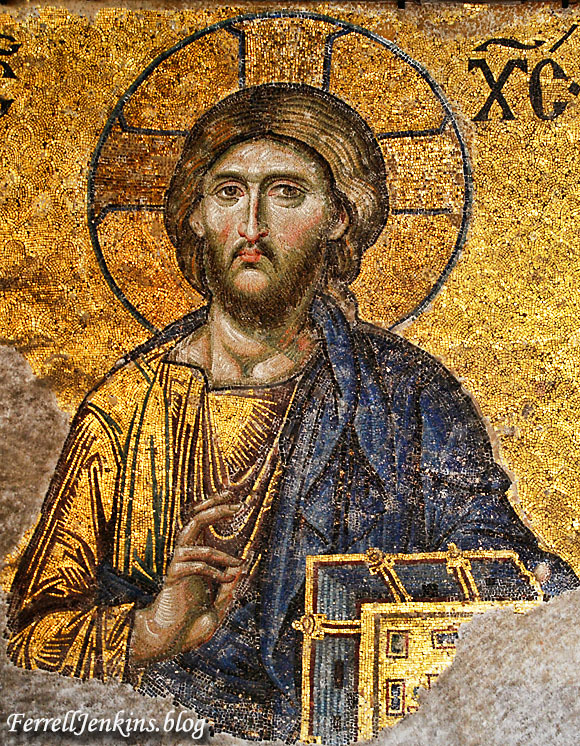 In such an event, Asia Minor, including the seven churches, would be caught in the middle and suffer from this invasion. 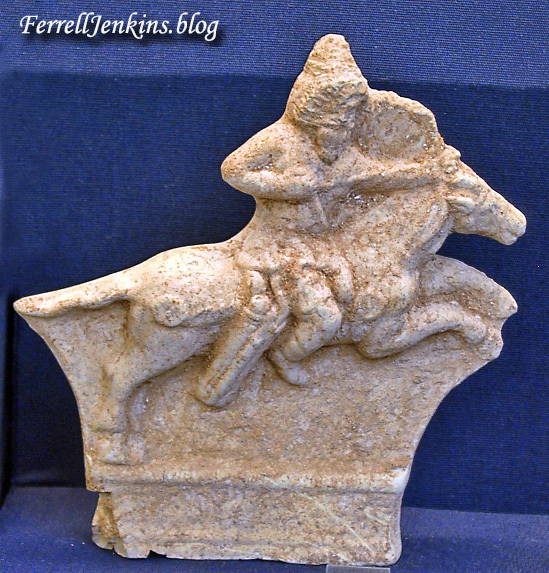 A ceramic plaque of a mounted archer from Parthia. British Museum. Photo by Ferrell Jenkins. Located on the eastern bank of the Tigris River near present-day Baghdad, Iraq, the city of Ctesiphon served as a royal capital of the Persian Empire in the Parthian and Sasanian eras for over eight hundred years. The city’s most iconic structure was the Taq Kasra (Arch of Khosrow) palace, one of the wonders of the ancient world. Built by the Sasanian ruler Khosrow I (reigned 531–79), the palace’s vaulted brick throne room measures eighty-four feet across, making it the largest of its kind. To celebrate this exceptional monument, Touraj Daryaee, Matthew Canepa, Katharyn Hanson, and Richard Kurin discuss the site’s importance and recent preservation efforts. Then, watch the first documentary on this unique monument, Taq Kasra: Wonder of Architecture, directed by Pejman Akbarzadeh, produced by Persian Dutch Network, and funded by the Soudavar Memorial and Toos Foundations. Watch the trailer. This event was organized with support from the Tina and Hamid Moghadam Endowment for Iran and the Ancient Near East and the Ancient Near East Fund. From Tel Megiddo one has a good view of the Jezreel Valley. Our panorama is composed of three photos made from the same spot at Megiddo. The Jezreel Valley lies before us to the north (and slightly east). Nazareth is located in the mountains of lower Galilee. The valley continues east between the Hill of Moreh and Mount Gilboa to Beth-Shean, the Jordan Valley, and the mountains of Gilead. 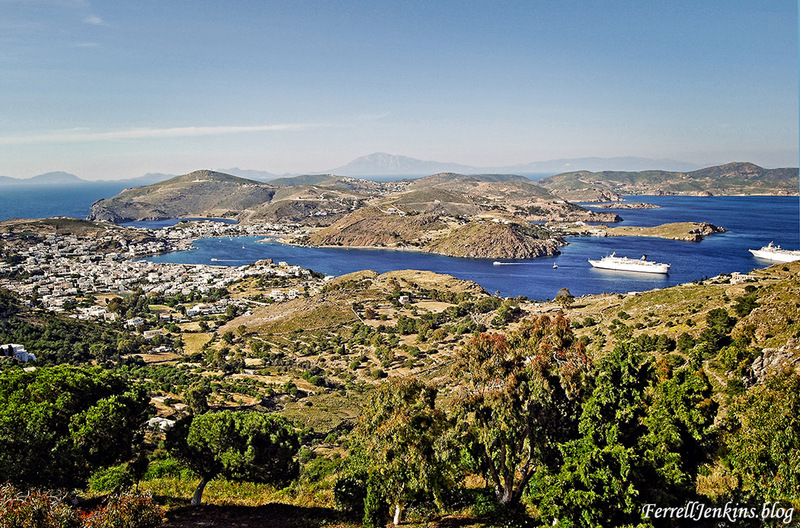 The valley was known by the Greek name Esdraelon in New Testament times. Panorama of Jezreel Valley from Megiddo. Photo by Ferrell Jenkins. For teaching purposes you may wish to use this annotated panoramic photograph. Click on the photos for the larger size suitable for Powerpoint. Annotated panorama of Jezreel Valley from Megiddo. Photo by Ferrell Jenkins. The vicinity of the Valley of Megiddo (Jezreel/Esdraelon) was the scene of many significant historical battles. In The Battles of Armageddon Eric H. Cline lists 35 battles fought or still to come in the Jezreel Valley. Many of these battles have to do with the Romans versus the Jewish Resistance, the Muslims and the Crusaders, and a few 19th century battles. I am listing some of the more significant battles affecting Biblical history. Thutmose III of Egypt fought Syrian forces – 1468 B.C. Joshua defeated the King of Megiddo – Joshua 12:21. Deborah and Barak defeated the Kings of Canaan – Judges 5:19. Gideon defeated the Midianites – Judges 7. Saul was defeated by the Philistines – 1 Samuel 28-31. Ahaziah, king of Judah, died there – 2 Kings 9:27. King Josiah was slain in a battle against Pharaoh Neco of Egypt – 2 Kings 23:29-30; 2 Chronicles 35:20-27. Megiddo, the tell overlooking the valley, became typical of national grief and a symbol of decisive battles, similar to modern Waterloo, the Alamo, or Pearl Harbor. No wonder it provides the symbolism for the decisive battle in Revelation 16. John’s Greek Har-Magedon becomes the English Armageddon. The NAU transliterates harmagedon as Har-Magedon. Other English versions use something similar to the ESV. This valley has been significant even in modern times. Here are just a few of those battles laying the foundation for the modern State of Israel. Napoleon advanced against the Turks in 1799. General Allenby and the British defeated the German-Turkish coalition in 1918. British officer Orde Wingate trained Jewish defense forces in this valley in the 1930s. Later leaders of the War of Independence (1948-1949), including Moshe Dayan and Yigal Alon, were trained by Wingate. General Allenby read the historical survey about the importance of the valley in G. A. Smith’s Historical Geography prior to his battle against the German-Turkish coalition in 1918. In the later editions of his book Smith included that battle. 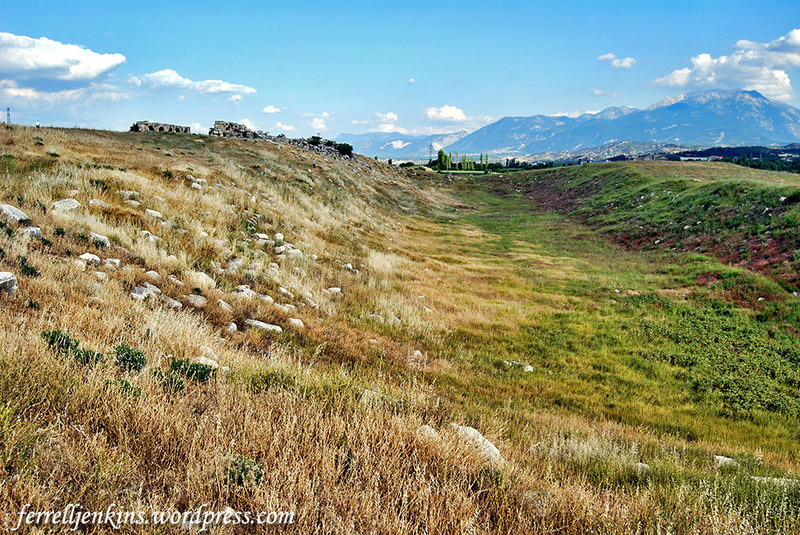 In a future post, perhaps later this week, I plan to discuss the water system at Megiddo. The Pergamum Museum in Berlin gets its name from the reconstructed altar of Zeus from Pergamum (Bergama) in western Turkey. I noted earlier that this fabulous reconstruction is now closed for refurbishing. When we visited the Museum in mid-August, 2014, some scaffolding was already in place. The Pergamum Altar in the Pergamum Museum. Photo by Ferrell Jenkins. 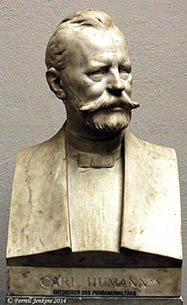 “A German engineer named Carl Humann had been authorized to build a road from Pergamon to the Aegean Sea. While he was supervising the work he noticed that marble statues and torsos were being carted from the ruins of the city and brought to the limekiln to be burnt into lime. It is to be feared that many a valuable statue was thus reduced to limestone. One day Humann also observed, how a peasant was hauling a marble slab adorned with statues and figures to the limekiln. He halted the peasant, asked him, how much he wanted for the slab, paid the price and immediately had the slab sent to the curators of the Berlin Museum in Germany. He offered the peasant more money, if he could procure additional slabs for him. The peasant gladly consented. For him it was lucrative business; for the curators it was a precious find. Alexander Conze, a curator in Berlin, discerned the great value of the find. He recalled having read that a Roman writer named Ampelius living in the second century after Christ had written a Book of Wonders (Liber Memorialis). Among the wonders he also had mentioned the Altar of Zeus in Pergamum. This was a valuable clue for Conze. Humann was at once requested to obtain as many slabs a possible. Permission was also requested of the Turkish Government to have the slabs sent to Berlin and that excavations could be started at once. Permission was granted and the excavations were carried out from 1879-1885. Fortunately most of the ruins of the Temple had not as yet been found or touched. The curators in Berlin could piece them all together and thus the priceless Altar of Zeus could be assembled” (Koch, The Christian News, Nov. 22, 1976). The Altar of Zeus was re-assembled in more than twenty years of museum work and is now housed in the special Pergamum Museum in Berlin. A trip to see this fabulous piece of architecture is recommended. 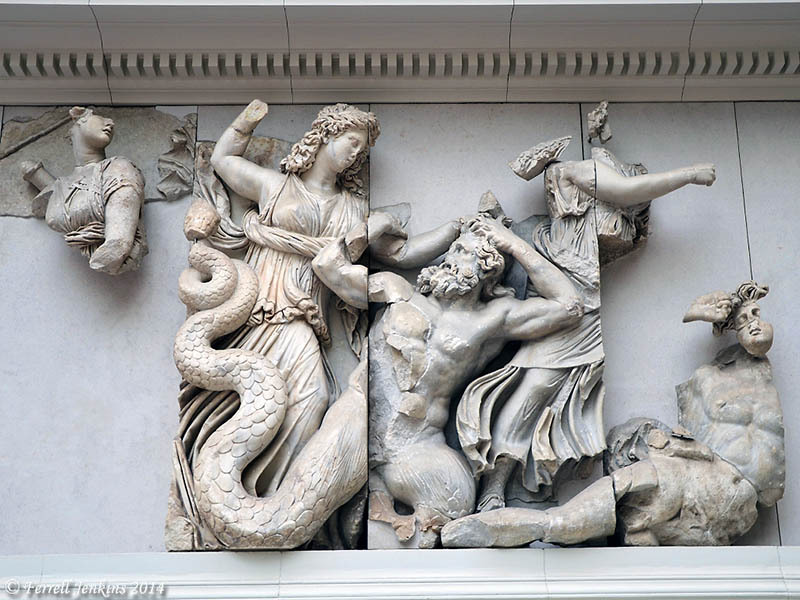 The marble frieze depicts the mythological battle between gods and giants. The photo below shows a small portion of a scene. A portion of the Zeus Altar marble frieze. Photo by Ferrell Jenkins. 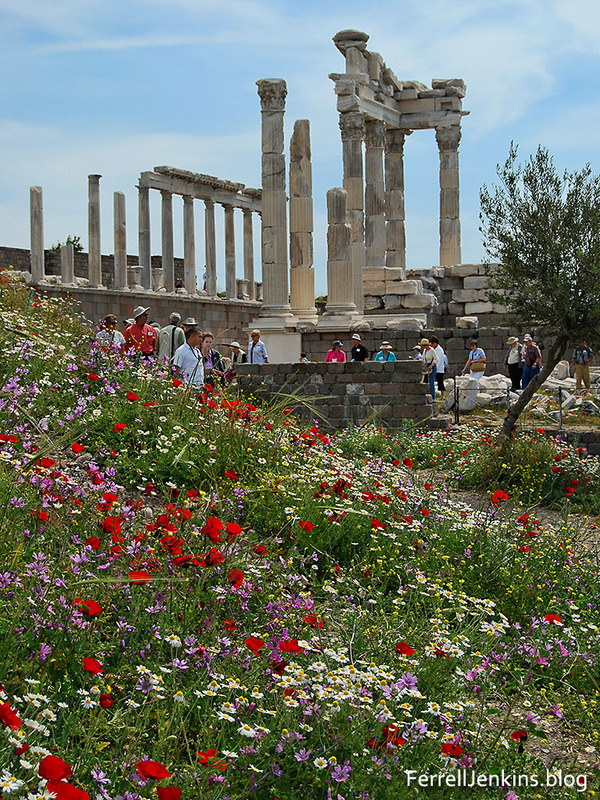 Only the foundations of the altar can be seen at Pergamum. The Turkish government has requested the return of the Zeus Altar and has been putting pressure on Germany. See one report here. 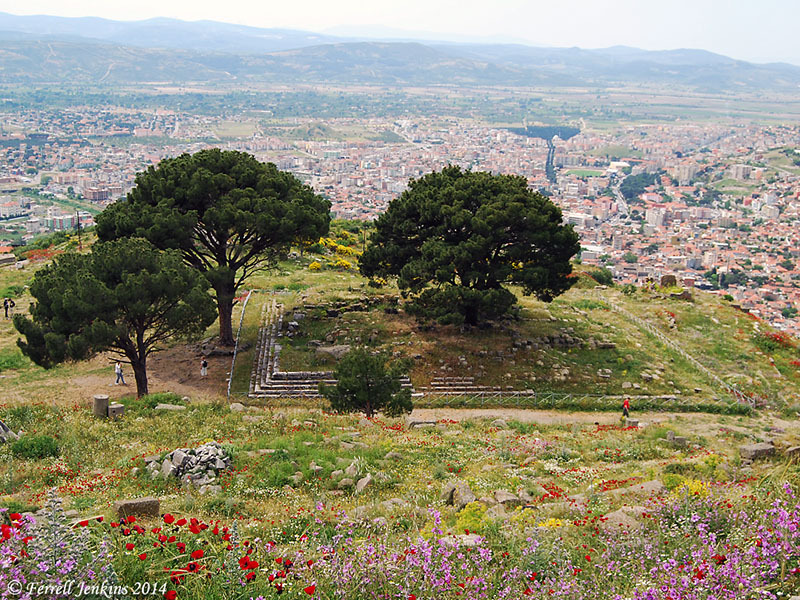 Site of the Zeus Altar at Pergamum. Photo by Ferrell Jenkins. To a traveler coming from the east, the acropolis [of Pergamum] had the appearance of a throne. The altar of Zeus Sōtēr seemed to be a throne. Asclepius Sōtēr was identified with the serpent. Pergamum was the center of emperor worship. Or, it might be a combination of these elements. 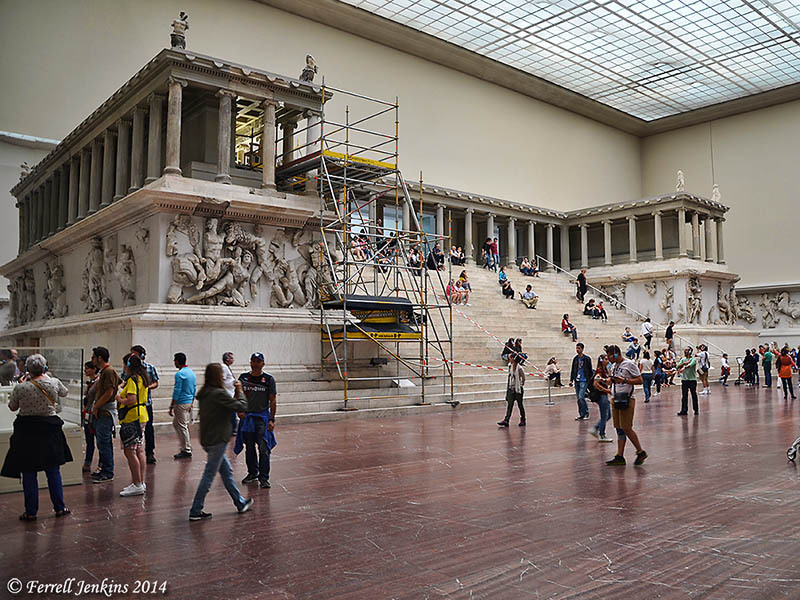 You will probably need to wait two or more years before you can see the Zeus Altar in the Pergamum Museum.